Gravity is an essential force in the Universe, governing the dynamics of planets, stars and galaxies. The law of gravity is tested accurately at scales between 10-4m in laboratories and 1014m in the solar system. However it is untested both on small and large scales by conventional methods. The Universe we live is expanding: the size of the Universe was tiny, as small as 10-35m, in the beginning of the Universe but its size today reaches 1026m. Thus Cosmology provides a means to test the nature of gravity on both tiny and massive scales. The standard model of cosmology assumes Einstein’s General Relativity (GR) as a theory to describe gravity on all scales. 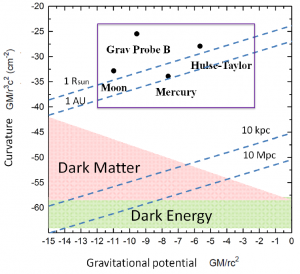 According to GR, the expansion of the Universe must be slowing down now. In 1998, astronomers made a surprising discovery that the expansion of the Universe was indeed accelerating not slowing down. This discovery was the subject of the Nobel Prize in Physics 2011. This late-time acceleration of the Universe has become the most challenging problem in theoretical physics. 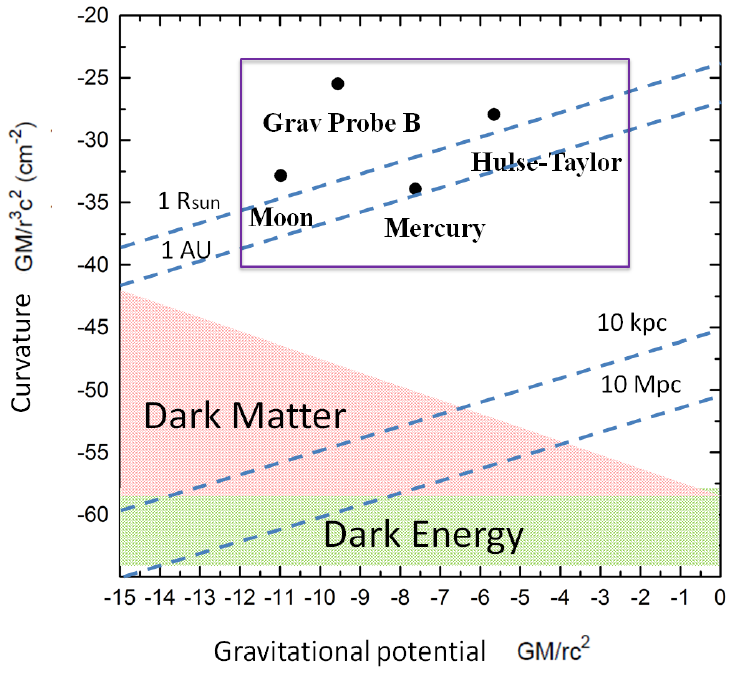 Within the framework of GR, the acceleration would originate from an unknown “dark energy”. The simplest option is the cosmological constant, first introduced by Einstein. However, in order to explain the current acceleration of the Universe, the required value of the cosmological constant must be incredibly small. Alternatively, there could be no dark energy and GR itself is in error on cosmological scales. Given that the standard model of cosmology is based on a huge extrapolation of our limited knowledge of gravity (Fig.1), this discovery of the late time acceleration of the Universe may require us to revise the theory of gravity and the standard model of cosmology based on GR. ICG researchers are developing cosmological tests of gravity and seeking solutions to the origin of the observed accelerated expansion of the Universe by challenging conventional GR. Over the next five years, a number of vast astronomical surveys of the galaxy distribution are underway, such as Dark Energy Survey (DES, 2012-2017), extended Baryon Oscillation Spectroscopic Survey (eBOSS, 2014-) and Mapping Nearby Galaxies at APO (MaNGA, 2014-). Future surveys such as ESA’s Euclid mission provide an opportunity to perform ultimate tests of gravity on the largest scales in our Universe. The ICG is one of only a few institutes in the world that have access to all these international surveys. Probing modifications of General Relativity using current cosmological observations, Physical Review D, vol. 81, Issue 10, id. 103510 (2010), Gong-Bo Zhao, Tommaso Giannantonio, Levon Pogosian, Alessandra Silvestri, David J. Bacon, Kazuya Koyama, Robert C. Nichol, Yong-Seon Song.